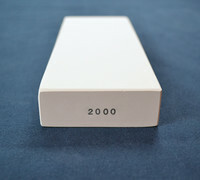 Our man made -or synthetic- sharpening stones (water stones) are produced by "vitrification" - a method by which both ceramic binder and abrasive material are blended under pressure and then baked for 36 hours at an unusually high 1300 degrees celcius (over 2,300 degrees fahrenheit). Stones made in this way are superior not only in sharpening (the bound particles interact with microscopic air bubbles to create the sense of a brand new stone with every use), but for their durability, resistance to alkalai and acids and suitability for all climates as well. 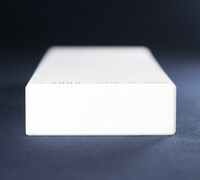 Our vitrified stones are much harder, will last and stay flat longer, and will cut faster than almost all other man made stones on the market. 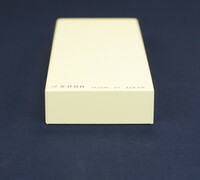 Rough stone (particle size 80-220) - This is used for badly nicked or worn blades to quickly shape the steel and prepare for finer sharpening. Note: rough stones are available only by request. 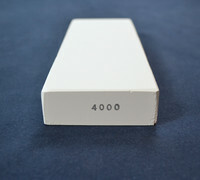 For rough sharpening applications, we recommend our 400 grit Atoma diamond plate sharpener. 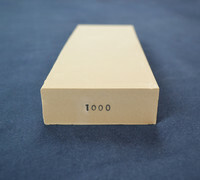 Medium stone (particle size 400-1200) - This is used for the majority of steel sharpening, to quickly sharpen dull blades. 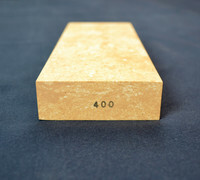 Although owning all three would be optimal, the medium stone is our recommended "starting" stone for beginners. 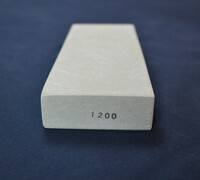 Finishing stone (particle size over 2000) - This stone is used last, to eliminate the tiny scratches left by the medium stone and finish the steel to a beautifly sharp edge. For proper lubrication, all of our water stones should be thoroughly soaked - or better yet, stored in water before each use. 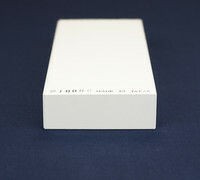 Please feel free to browse through our selection of superior sharpening stones, and please, contact us if you have any further questions or comments.